A lot of people have asked me about how to carry fuel for their alcohol stoves. Here are a few ideas and what I use but I'd love to hear what you guys carry as well. 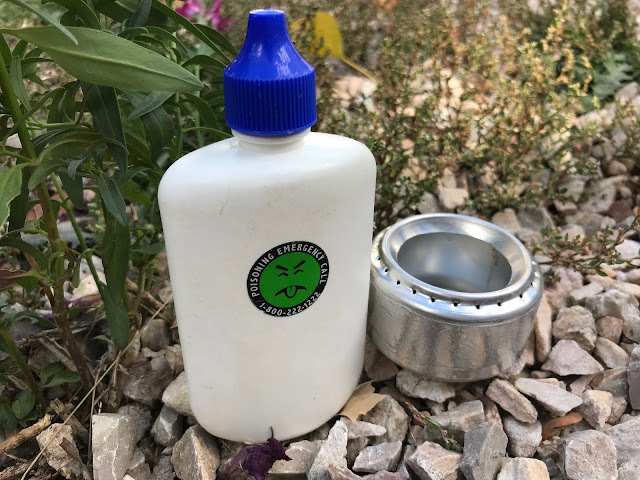 For years I used a SIGG fuel bottle (I have several) but these now live in the shed as storage containers as they are too heavy for backpacking. I like the lens cleaning solution idea, but do not wear them anymore (I finally got lazered!). Right now I carry the 4 oz bottle from REI. Works fine and cost so little, it is hard to go wring. I DO liek the idea of a finer stream, though. If I have one complaint about my current bottle, it is that I can end up splashing out too much fuel. Maybe I will check out Big Lots or something, to see if I can score a big bottle like that for cheap. How do you fill that contact lens solution bottle where the top is just so narrow? Did you widen the opening to allow the funnel you showed to fit? Stephen if it's like the smaller eye dropper bottles that I use for mountain suds then the dropper bit can be removed. It took a while to figure out how to modify the dispenser so I could fill the bottle easily. Also, instead of a funnel, I use a short length of rubber tubing to draw fluid in. @Stephen, the lid pops off the contact solution bottles. It's tough, but a blunt object can help you pry it off. I carry a 4oz(ish) bottle with me as my primary fuel canister. Anyone use the Rum Runner Flasks? I have, but can't find a nozzle that will fit for easy dispense. ..though a much smaller size. The lid pries off and you can fill it easily. I'm new to the alcohol stove so I cant say I have years of experience with what bottles are the best. But with that said, I use a nutrasweet (liquid sweetner) bottle, for its fine dispensing stream. I had to push a small nail though the opening just to give it a larger stream. I just use the boring plastic squeeze bottle like the one you can get from REI. I found mine locally in a hardware store. Brasslite still sells 8oz and 16oz "measuring" dispenser bottles. I found them a little too finicky, but YMMV. They make great stoves. The dropper part is actually very easy to take off on the bottle I use. You don't pull it out straight. You kind of apply pressure from the side and "bend" it off. It's easy to get back on and very secure. I'm sure it varies by type of bottle and brand though. I use a (now empty) bottle of Sta-Bil that you can buy at any auto parts store. It's very similar to the one that Aaron sells at Brasslite. It holds a little over 8oz of liquid. I have a couple of 4oz flip-top bottles that I got from Tinny at MBD. I marked 1oz increments on the side in marker, and put some clear shipping tape over it so they don't rub off. Also, I put a little food coloring (green - red looks like Kool-Aid) in the fuel to make it easier to see. Whatever you use, remember to close it securely and put it away from the stove before lighting the stove. If left open and the vapors from the spout ignite the bottle will pop and the flaming contents will spill. If you happen to be holding the bottle when this happens, you can get doused with burning alcohol, which is a really unhappy thing that can lead to a year's worth of visits to a burn clinic, or worse. Don't ask me how I know. I use a couple different bottles. One is a big 14 oz baby oil bottle. I use this on extended trips where Ill be in a remote spot for a week or more. I usually use my 7 oz bottle which is an band-aid antiseptic wash bottle. I like that it is more flat so it fits in a mesh side pocket without causing bulk. I fill and measure my stove with a childs oral syringe. It came with a rubber cone stopper that the syringe taps into to draw out liquid. It measrues half ounce incriments so I know exactly how much fuel Im using. you can also leave in the top piece so you have a little stream to fill with but if you remove it the bottle wont leak with the cap on trust me, I sqeeze it all the time at classes. I pretty happy with it. Maybe Ill do a video on it on my site so you can see the settup. I am brand new to alky stoves. I have made some pepsi can stoves and some bud light bottle stoves and a supercat. I also purchased the white box solo stove. It came with the windscreen, heat reflector and a 4 oz plastic bottle with a flip top lid. (It is very nice). I was planning on doing the same as Joe and Lisa and marking the bottle. I was going to mark it on opposite sides. One side with the bottle setting upright and the other setting upside down (since it will be upside down while squeezing. )So that I can tell the difference I will write right side up each way, that way it won't be confusing (one side will always be upside down). I did not think of using the tape, but now that Ive read it, I can't think of why I didn't think of that. Great tip, thanks. I like the little 12oz Coke bottles, I use it for a trip or two then recycle it so I don't worry about the plastic failing and its a little tougher then an Aquafina bottle. I am new to alcohol stoves( 1 week) and have already been converted to open top stoves due to their ease of use and construction. Well i was at the store and since i don't wear glasses it was hard for me to spend the $6-$8 for a lens solution bottle just to dump it down the drain. i was walking through the back to school isle at Target and saw the Elmer's white glue bottles. you can get them on sale for $.44. I got a few 4 oz and 7.5 oz bottles. I emptied the glue into a ziplock bag(kids can make glue goop to play with) and used soap to clean the bottles. They need a funnel to be filled but work great. They give you the strait fine stream that the lens solution bottle does but for a fraction of the cost. i filled them up and squeezed the bottle really hard with no leaks. (one leaked until i swapped it with another lid, now it works). the caps twist down really tight. if you take the label off there is a sticky residue. use a alcohol wipe and it will all come off. Hope this helps. i have renewed my old passion of hiking in only a week because of all the great advice you have given on your blog and youtube videos. Thank You so much.